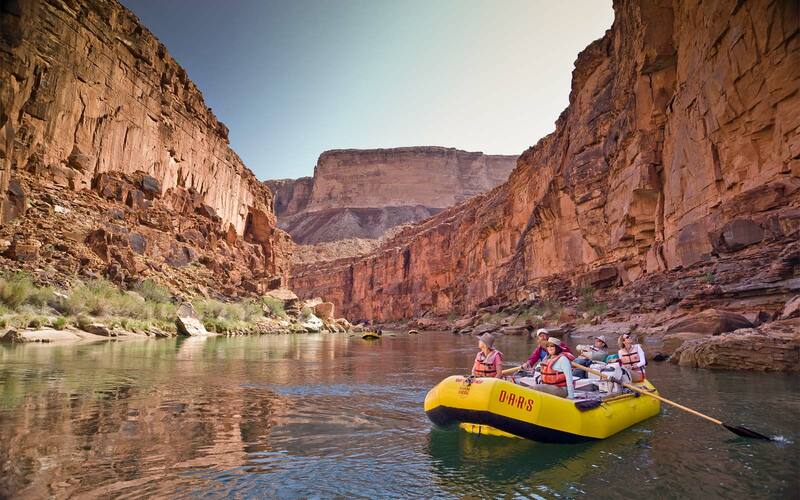 You’ve been booked on your Grand Canyon rafting trip for months—or maybe closer to two years—and now the wait is over. 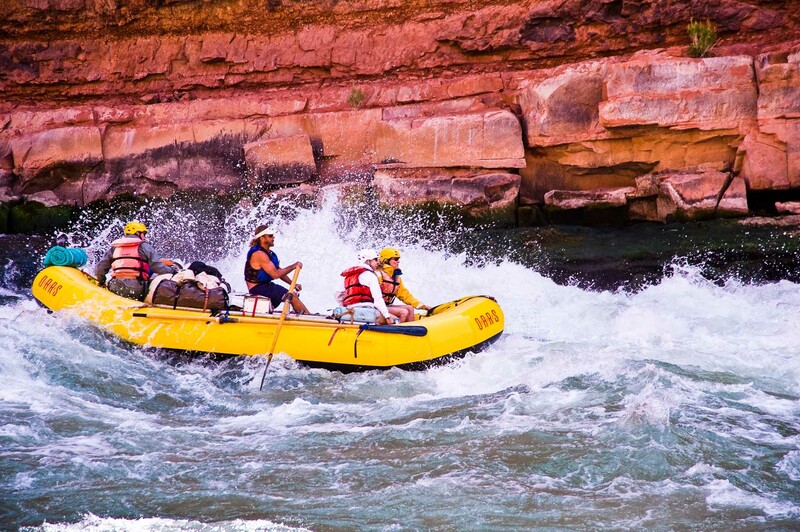 The time has come to embark on one of the greatest river adventures on the planet. So, let’s get packing! 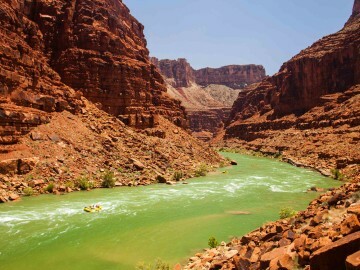 Joy Parades, OARS Grand Canyon Adventure Consultant, shares the ins and outs of packing for a Grand Canyon rafting trip. Don’t wait until the last minute. You’ll just get stressed out. Start planning early by reading the trip information that was emailed to you. Select your beverage of choice, sit down, relax, and have a good read. 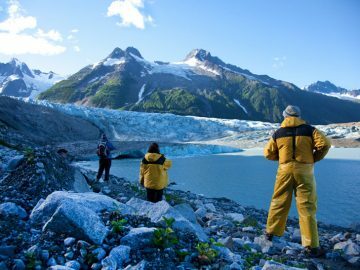 The itinerary includes a detailed packing list and description of what to wear and how to pack. All of the items are on the list for a reason. I personally do not like to pack gear that I may not use, but I would rather be prepared instead of miserable on my vacation. “My stuff won’t fit in the waterproof bags!” If you bring what is on our packing list, I assure you, there will be room for everything. Your gear will be divided between two large waterproof bags (one for clothing and personal items and one for your sleep kit), daypack and small waterproof bag. The large waterproof bags are your “checked luggage” and only available from when you arrive in camp each afternoon until you pack up the next morning. The daypack and small waterproof bag are your “carry-on luggage” and will be with you on the boats to access during the day. 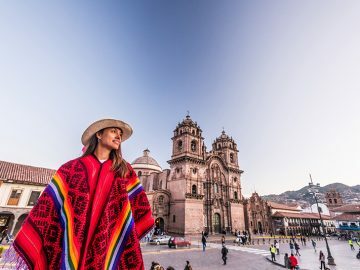 These bags should have such items as rain gear, hiking shoes/socks, camera, eco-friendly sunscreen, lip balm, medications, extra layers of clothing and any small things you don’t want squished in your large bag. If you bring something with you that won’t be used on the river, pack it at the bottom of your large waterproof bag—travel clothes, valuables (wallet, car keys, etc.) and collapsible duffel (if you are doing a partial canyon trip). Our bags are cylindrical in shape like a tube standing on end, so whatever you put in the bottom will stay there. I use one- or two-gallon Ziploc® bags to organize my gear. They allow you to easily see what you have and keep everything clean. In each individual Ziploc® bag categorize your gear like toiletries, camp clothes, underwear/long underwear, book/notebook, etc. I like to put a basic “outfit” in one bag with my swimsuit, shorts and a long sleeved shirt. Bulky items like a fleece top or bottom can be packed directly into the waterproof bag. For your daypack, I recommend putting everything in a plastic bag first and then into the pack. 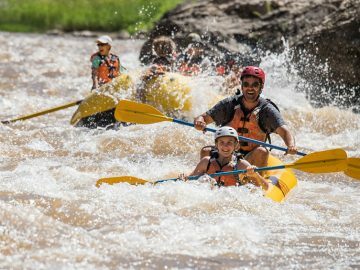 There’s a good chance your daypack will get wet while going through rapids. Plan on wearing your clothes for multiple days. Clothing can easily be washed out in the river with eco-friendly biodegradable soap like Campsuds or Dr. Bronners. 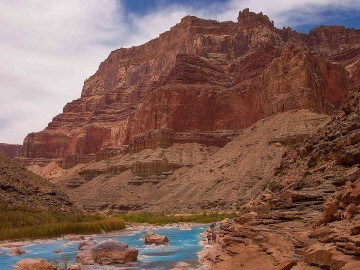 The climate in the Grand Canyon is extremely dry, so laundry dries out quickly. This is one of the most important elements of dressing and packing for a Grand Canyon trip. Instead of bringing one heavy top and bottom, you want to have several pieces of synthetic clothing to layer. This gives you the ability to adapt to a variety of weather conditions. Clothing made of synthetic fibers will wick the moisture away from your skin and keep you warm, even if wet. Only when you have hot, dry days on the river, is cotton preferred. You can douse your cotton shirt in the river and the soaked cotton will have a cooling effect. With that said, July and August can be very hot, but these months are also traditionally known as the monsoon season. Thunderstorms this time of year can produce heavy downpours causing the temperature to plummet for a period time. Raingear will only keep you dry, but a fleece top and bottom can take the chill off until the storm subsides and it warms up again. For spring or fall trips, I would suggest bringing two sets of long underwear, as well as fleece. If you have a cooler day, you will want to wear one set on the boats, but still have a second dry set to wear in camp. 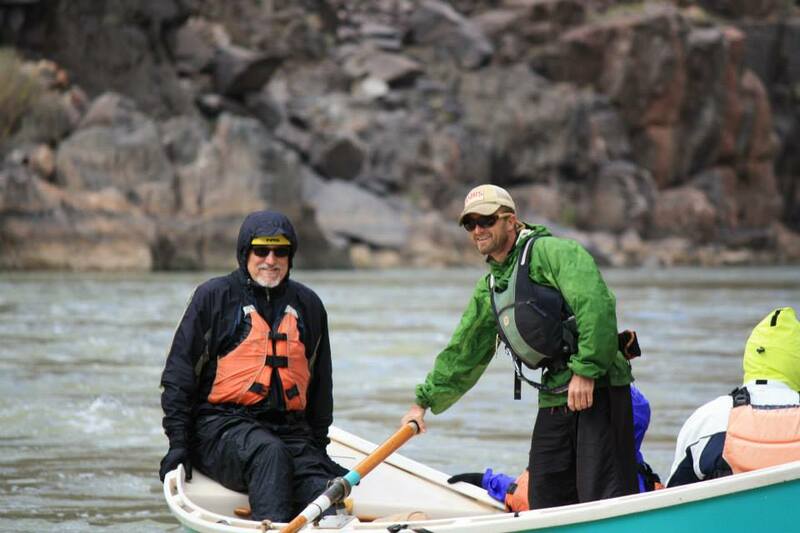 Rain gear is very important no matter when you float through the canyon. It’s not just for rain. A waterproof jacket and pants protect you from rain, splash from the rapids and wind and they can be that one last bit of insulation you need to stay warm. Note the key word is waterproof, not just water-resistant. Shortly before your trip departs you should check on the weather forecast in the Grand Canyon. Based on the forecast you may want to make some modifications to your packing. 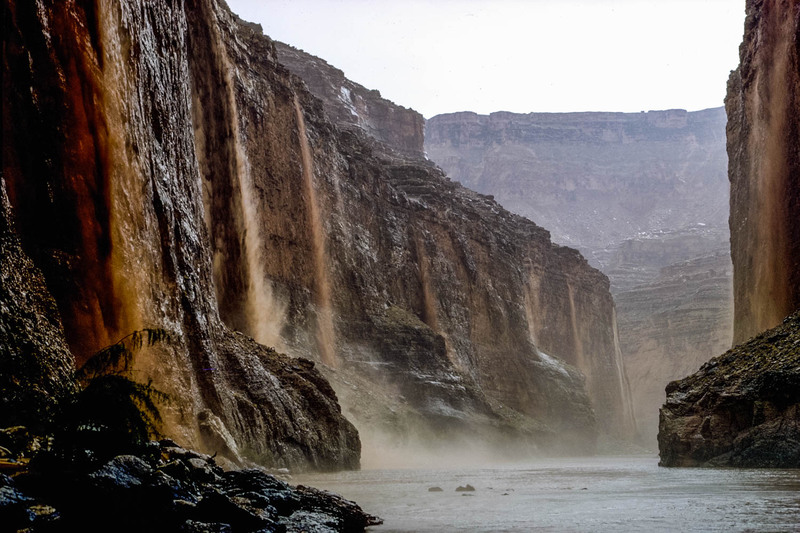 Make sure you use a website that lists information for conditions in the Grand Canyon along the Colorado River, like the NOAA National Weather Service. The rim is over 6,000 feet and generally runs about 20-25 degrees cooler than the temperature along the river. And my last piece of advice is that your river clothes should serve a function. Depending on the season, they will be your sun protection, keep you dry from rain and rapid spray or provide warmth. Functionality should take precedence over fashion. In camp you will want to take off your river clothes and get comfortable. This is where you might want to mix it up with something fun and fashionable. Maybe a colorful sarong, printed happy pants, Hawaiian shirt or tie-dyed sundress. Have fun with it. It’s your amazing adventure! 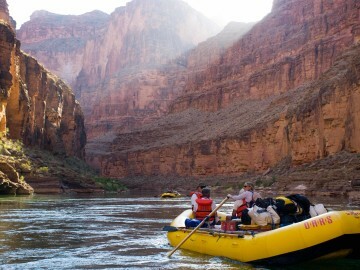 Joy Parades is OARS’ Grand Canyon Adventure Consultant.